St. Martin's Press, 9781250006011, 320pp. 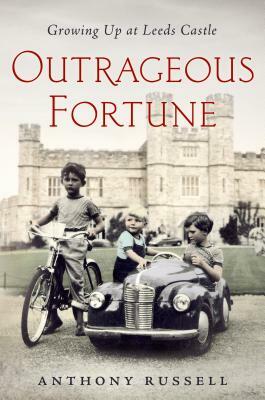 In his stunning memoir, Outrageous Fortune, Anthony Russell takes us inside his childhood growing up at Leeds Castle, with luxury and opulence few can imagine, and how he found his way in a changing society. "I was lucky with lineage. Money, and lots of it, appeared to grow on trees, especially those which adorned the Leeds Castle parkland. Ancestors with glowing titles and extraordinary accomplishments filled the history books, but there would be consequences for being handed everything of a material nature on a plate, with no clear indication of what one might be expected to do with such good fortune." Leeds Castle has long been hailed as the loveliest castle in the world. Originally built in the twelfth century as a Norman stronghold, the castle once housed Kings and Queens, but fell into disrepair for nearly a century, until Anthony Russell's grandmother, Lady Baillie, purchased it in 1926 and restored the fortress to its former glory. It was in the castle's fairytale setting, surrounded by a moat and acres of sprawling grounds, that Anthony spent his childhood in the 1950s. It was a life of spectacular beauty and privilege, but for a shy boy often lonely and fraught with the fear of breaking some unwritten rule of the Castle Way. As Anthony reveals in his extraordinarily vivid and frank memoir, such a childhood was perhaps not the best preparation for modern life beyond the castle's walls. By the end of the 1960s, the polite reserve of the Castle Way was starting to give way to unconventional music, manners, and social freedom-simultaneously alluring and alarming to a young man who had grown up in splendid isolation in a world that would soon be gone. ANTHONY RUSSELL was educated at Stowe School, England. For more than five hundred years his family has served kings and queens of England as ministers, privy counselors, generals, and prime minister. He was raised at Leeds Castle, Kent, where his childhood was centered around the feudal world of his very rich grandmother, Lady Baillie, with occasional excursions to the much less grand castle of his other grandmother, Lady Ampthill, in Ireland. A writer, musician, and a composer, he currently divides his time between Los Angeles, California, and France. He is the author of Outrageous Fortune: Growing Up at Leeds Castle.